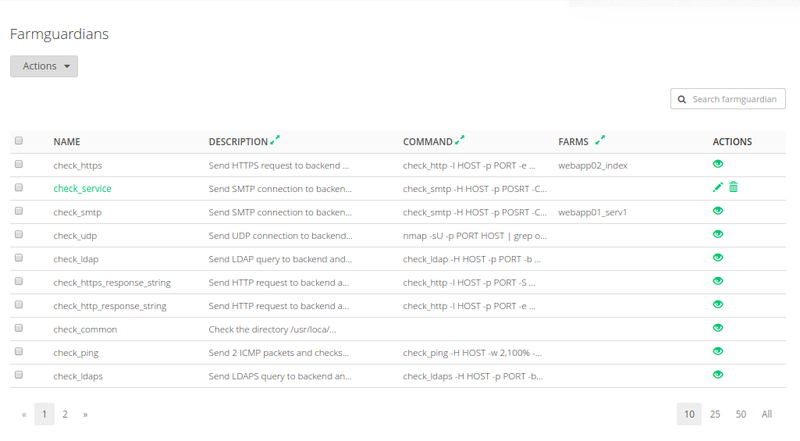 The Farmguardian section lists all the available health checks in the load balancer, a short description of every one and the farms where they’re applied. Farmguardian is used for advanced monitoring state of backends. When a problem is detected by Farm Guardian automatically disables the real server and will be marked as blacklisted. The health checks could be both pre-configured or custom. The two types of checks can be identified through the action column, the checks with the eye icon are pre-configured and the checks with the pencil and trash icon are custom checks. Create Farmguardian. To go to the Farm Guardian checks creation form. Delete. To destroy the selected Farm Guardian check. NAME. Identification name of the Farm Guardian check. DESCRIPTION. This field can contain some description about a certain health check. COMMAND. Check command and parameters to be executed on every interval against every backend. FARMS. Farms and services that uses a certain check. EDIT. It redirect to the configure screen of that Farmguardian check. Only for custom farmguardian checks. DELETE. It delete that Farmguardian check. If the check has configured some farm/service, then a notification will ask you if force the delete. Only for custom farmguardian checks. SHOW. It redirect to the configure screen of that Farmguardian check, but its global settings are not editable. Only for pre-configured farmguardian checks. The columns: description, command and farms are limited to 20/30 characters, if it appears ellipsis, you can press over expand icon of that column to see the complete list. After you can press over the collapse icon of that column to delimited the column again. check_tcp: Send TCP connection to backend. check_http: Send HTTP request to backend and expect a 200 OK response with a timeout of 5 secs. check_https: Send HTTPS request to backend and expect a 200 OK response with a timeout of 5 secs. check_http_response_string: Send HTTP request to backend, expect a 200 OK response and a given string in the HTML with a timeout of 5 secs. Change string by value to find in the response. check_https_response_string: Send HTTP request to backend and expect response of 200 OK and a given string in the HTML with a timeout of 5 secs. Change string by value to find in the response. check_ldap: Send LDAP query to backend and expect LDAP bind with a timeout of 5 secs. Change -b (base search), -D (user to bind), -P (user password). check_ldaps: Send LDAPS query to backend and expect LDAP bind with a timeout of 5 secs. Change -b (base search), -D (user to bind), -P (user password). check_smtp: Send SMTP connection to backend and expect a SMTP response OK with a timeout of 5 secs. check_imap: Send IMAP connection to backend and expect an IMAP response OK with a timeout of 5 secs. check_pop: Send POP connection to backend and expect a POP response OK with a timeout of 5 secs. check_udp: Send UDP connection to backend and check if port is opened. check_ping: Send 2 ICMP packets and check that the 100% reaches the host. check_common: Check the folder /usr/local/zevenet/libexec, which includes more checks, get more info about the health check with –help. Next step, create a custom Farmguardian check.